Some of the men, who are thought to be mainly young British Muslims of Pakistani origin, were arrested at a Chinese restaurant in the Borough area of the city. The men are being held on suspicion of the commission, preparation or instigation of acts of terrorism. The arrests were not linked to the recent alleged plot to blow up transatlantic airliners or the July 7 bombings in London, police said. Security sources said the probe was concentrating on the alleged recruitment and radicalisation of young British Muslims and the facilitation of training for terrorism purposes. It is not yet clear whether the men were part of one group, or separate groups who knew each other. 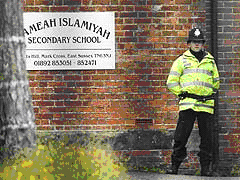 Police are searching the grounds of an Islamic school in Sussex and a large number of homes across London. Radical Islamic cleric Abu Hamza - jailed for seven years in February after being convicted of a string of race hate and terror charges - stayed at the school in Mark Cross, Crowborough, for a short period but was asked to leave. The Jameah Islamiyah secondary school opened in September 2003 as an independent day school for Muslim boys aged 11 to 16, with annual fees of £1,000.It is set within 54 acres and has 100 rooms, including outhouses. Its vast grounds are often used at weekends as a retreat for Muslim families living in London. According to its Ofsted report last December, the school had only nine boys on its roll, aged from 12 to 15. The establishment said in a statement to inspectors that it aimed to "provide a high standard of academic and Islamic education'' and to "develop real Islamic morals". However, Ofsted inspectors found the school failed to provide a satisfactory education for its pupils, and had significant weaknesses. 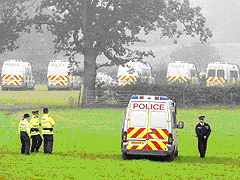 A Sussex Police spokeswoman said no arrests had been made at the school and that people living at the establishment at the time of the raid had been found other accommodation.